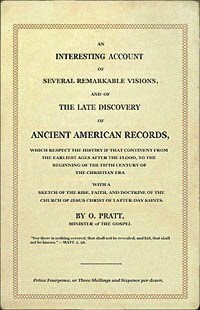 While on a mission in England, apostle Orson Pratt published the pamphlet “An Interesting Account of Several Remarkable Visions”. There are indications that Joseph Smith may have authorised this publication (Anderson 1996) but Pratt embellished the story of the first vision to sound more dramatic than any story ever written by Smith (Allen & Arrington 1969). Mr. Joseph Smith Jr., who made the following important discovery, was born in the town of Sharon, Windsor county, Vermont, on the 23d of December, a.d. 1805. When ten years old, his parents, with their family, moved to Palmyra, New York; in the vicinity of which he resided for about eleven years, the latter part in the town of Manchester. Cultivating the earth for a livelihood was his occupation, in which he employed the most of his time. His advantages for acquiring literary knowledge were exceedingly small; hence, his education was limited to a slight acquaintance with two or three of the common branches of learning. He could read without much difficulty, and write a very imperfect hand; and had a very limited understanding of the ground rules of arithmetic. These were his highest and only attainments; while the rest of those branches, so universally taught in the common schools throughout the United States, were entirely unknown to him. When somewhere about fourteen or fifteen years old, he began seriously to reflect upon the necessity of being prepared for a future state of existence: but how, or in what way, to prepare himself was a question as yet undetermined in his own mind: he perceived that it was a question of infinite importance, and that the salvation of his soul depended upon a correct understanding of the same. He saw, that if he understood not the way, it would be impossible to walk in it, except by chance; and the thought of resting his hopes of eternal life upon chance, or uncertainties, was more than he could endure. If he went to the religious denominations to seek information, each one pointed to its particular tenets, saying: “This is the way, walk ye in it” while, at the same time, the doctrines of each were, in many respects, in direct opposition to one another. It, also, occurred to his mind, that God was not the author of but one doctrine, and therefore could not acknowledge but one denomination as his church; and that such denomination must be a people who believe and teach that one doctrine, (whatever it may be), and build upon the same. He then reflected upon the immense number of doctrines, now in the world, which had given rise to many hundreds of different denominations. The great question to be decided in his mind, was - if any one of these denominations be the Church of Christ, which one is it? Until he could become satisfied in relation to this question, he could not rest contented. To trust to the decisions of fallible man, and build his hopes upon the same, without any certainty and knowledge of his own, would not satisfy the anxious desires that pervaded his breast. To decide, without any positive and definite evidence on which he could rely, upon a subject involving the future welfare of his soul, was revolting to his feelings. The only alternative that seemed to be left him, was to read the Scriptures and endeavour to follow their directions. He accordingly commenced perusing the sacred pages of the Bible with sincerity, believing the things that he read. His mind soon caught hold of the following passage: “If any of you lack wisdom, let him ask of God, that giveth to all men liberally and upbraideth not; and it shall be given him” (James 1:5). From this promise he learned that it was the privilege of all men to ask God for wisdom, with the sure and certain expectation of receiving liberally, without being upbraided for so doing. This was cheering information to him: tidings that gave him great joy. It was like a light shining forth in a dark place, to guide him to the path in which he should walk. He now saw that if he inquired of God, there was not only a possibility, but a probability; yea, more, a certainty that he should obtain a knowledge which, of all the doctrines, was the doctrine of Christ; and which, of all the churches, was the church of Christ. He, therefore, retired to a secret place in a grove but a short distance from his father’s house, and knelt down and began to call upon the Lord. At first, he was severely tempted by the powers of darkness which endeavoured to overcome him; but he continued to seek for deliverance until darkness gave way from his mind; and he was enabled to pray in fervency of the spirit and in faith. And, while thus pouring out his soul, anxiously desiring an answer from God, he at length saw a very bright and glorious light in the heavens above; which at first seemed to be at a considerable distance. He continued praying while the light appeared to be gradually descending towards him; and as it drew nearer, it increased in brightness and magnitude so that by the time that it reached the tops of the trees, the whole wilderness for some distance around was illuminated in a most glorious and brilliant manner. He expected to have seen the leaves and boughs of the trees consumed as soon as the light came in contact with them; but, perceiving that it did not produce that effect, he was encouraged with the hopes of being able to endure its presence. It continued descending slowly until it rested upon the earth and he was enveloped in the midst of it. When it first came upon him, it produced a peculiar sensation throughout his whole system; and immediately his mind was caught away from the natural objects with which he was surrounded; and he was enwrapped in a heavenly vision, and saw two glorious personages who exactly resembled each other in their features or likeness. He was informed, that his sins were forgiven. He was also informed upon the subjects, which had for some time previously agitated his mind, viz. that all the religious denominations were believing in incorrect doctrines; and consequently, that none of them was acknowledged of God as his church and kingdom. And he was expressly commanded to go not after them; and he received a promise that the true doctrine - the fulness of the gospel - should at some future time be made known to him; after which the vision withdrew, leaving his mind in a state of calmness and peace indescribable. Some time after having received this glorious manifestation, being young, he was again entangled in the vanities of the world, of which he afterwards sincerely and truly repented.